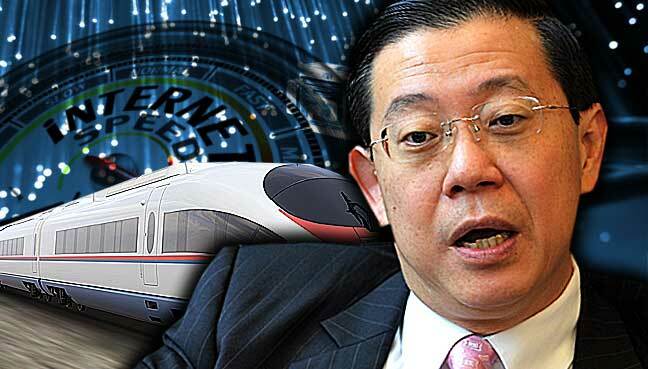 Malaysia needs to put in infrastructure for high speed Internet in order to catch up with other Asean countries, Penang Chief Minister Lim Guan Eng said. The Penang lawmaker said the country needs high speed Internet in order to progress. “No point having high speed train or high speed train when we don’t have high speed Internet,” he said in a press conference after opening the Crowd Economy Conference here this morning. He said China is more advanced than Malaysia where they used e-wallets instead of cash. “They are more advanced than us and this is because they have high speed Internet, we have a lot to catch up on,” he said. He said we may be able to travel from Kuala Lumpur to Singapore fast but the Internet speed must be faster. “We must have high speed Internet, otherwise, everything goes to Singapore,” he said. Lim said Vietnam and Singapore also have higher Internet speed than Malaysia. In Penang, he said the state government is ready to allow telco providers to put in infrastructure for high speed Internet in the state. Telco providers are welcomed to apply with state executive councillor Chow Kon Yeow who is in charge of telco issues, he added. OUCH! Canadian Asian Man Got Beat Up For A Mistake By Zara!! This Thief Was Caught By Raging Public After He Snatches Away A Girl’s Smartphone!! !